BUFFALO, N.Y., July 20, 2010 -- Northrop Grumman Corporation's (NYSE:NOC) Amherst Systems business unit has announced the winners of its third annual Northrop Grumman Engineering Scholars program, which awards two $10,000 college scholarships to local area high school students interested in pursuing a career in engineering. 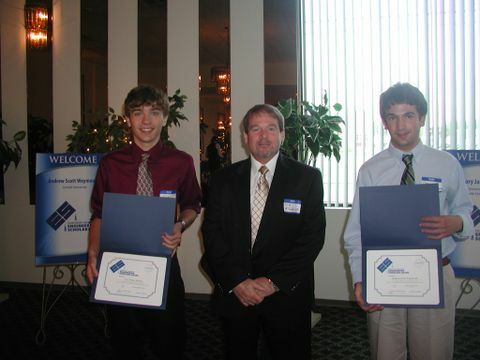 Cory James Mikida, a graduate of Hamburg High School, and Andrew Scott Weymouth, a graduate of Canisius High School, received merit-based scholarships from the company for their exceptional academic achievements and community involvement during an awards reception held at the Protocol Restaurant. This fall, Mikida will be attending the State University of New York at Buffalo, while Scott will be attending Cornell University. "Northrop Grumman is committed to providing support for education in our local communities, especially in the areas of science and math," said John Stanfill, president of Northrop Grumman Corporation's Amherst Systems business unit. "Through this scholarship program, we are helping promising young adults interested in engineering careers achieve their goals." To be eligible for the Engineering Scholars program, applicants had to be residents of Erie or Niagara counties, graduating seniors in the spring of 2010 from a public or accredited private high school, and attain established SAT and GPA requirements. Candidates must be planning to attend an accredited college or university as a full-time student in an approved engineering program. The funds may be used for tuition, books, lodging and meals. Northrop Grumman is a significant financial and in-kind contributor to educational outreach programs aimed at encouraging young people to consider engineering and science-related career fields. Amherst Systems, located in Buffalo, N.Y., is involved in the design, development and manufacture and support of electronic warfare simulation, test and training systems.